I’m so thrilled to see this quilt finished! 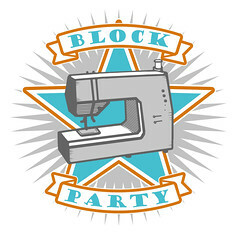 If you’ve been reading for a while, you might remember that the Block Party quilting bee was the first bee I was asked to be a part of. This bee was started by Alissa & Kristen (who then later worked together to write Block Party – The Modern Quilting Bee ) and included so many fabulous quilters! My month came around during the summer of 2009, and I decided to pull a variety of fabrics from my scrap bin. I sent a random selection to each bee member and asked them to create blocks in the style of Denyse Schmidt’s Drunk Love in a Log Cabin. And wow, the blocks I received back are absolutely gorgeous! They are a riot of colors and patterns and it makes me smile to see all those happy colors side by side. I decided to sew up enough extra blocks to turn this into a queen sized quilt, wanting desperately to see this on my bed. As so often goes, I got the blocks completed and sewn together into a quilt top, and then there was just one little extra step that caused me to procrastinate and to continue to put off finishing this quilt. In this case, the quilt needed just a little bit of extra length. When I finally pulled it back out (after more than a year! ), it really only took a tiny bit of time to add a narrow pieced border to the top and bottom. I’ll never learn! Anyway, back to the quilt… For the backing I used an Amy Butler solid in aqua and created a pieced column along one edge. It’s free motion quilted in a meandering pattern, and then bound with a pieced binding, made up primarily with a Lecien polka dot. This quilt is now at home on my bed at long last, and I couldn’t be happier. An enormous thank you to all the wonderful ladies of Block Party (Alissa, Kristin, Jacquie, Elizabeth, Ashley, Sarah, Lisa, Rashida, Nettie, Josie & Megan) – this quilt is all the more special knowing how many had a hand in helping make it what it is! 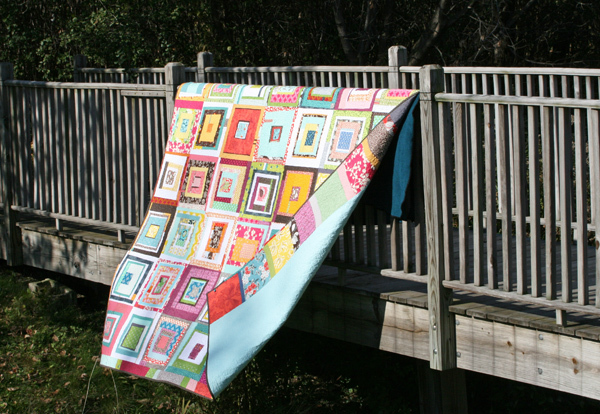 This entry was posted in [search] Square-in-Square Quilts, Posts about Quilts, Quilts and tagged Block Party, denyse schmidt, drunk love in a log cabin, fabric scraps, handmade, improv blocks, quilt, Quilt Blocks, quilting, quilting bee, square in square blocks. Bookmark the permalink. It is beautiful! I’m glad to know I’m not the only one who gets snagged by what turns out to be more of a mental hiccup. Love it – fantastic quilt! 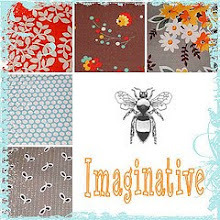 What a beautiful collection of fabrics! It looks gorgeous… congratulations on finishing it, a great accomplishment for sure. 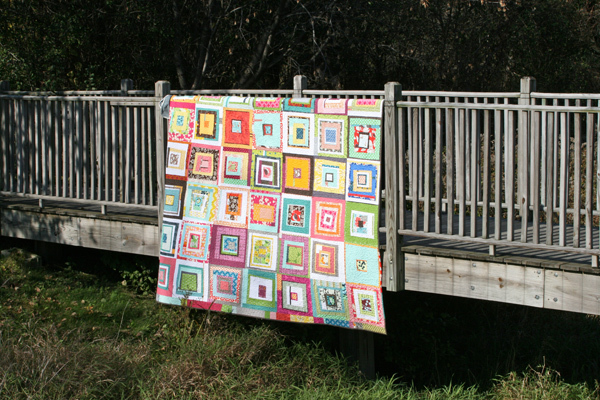 The quilt is beautiful and one day I hope to build up the strength to get a queen quilt done…. maybe next year when the FMF comes back out?!?! Who is excited about that?!?!?! YAY!!!! Uber pretty. You did a nice job. Only thing missing is the little guy. This quilt is gorgeous. And it’s made extra special by knowing that all those amazing helping hands had a part in its creation. 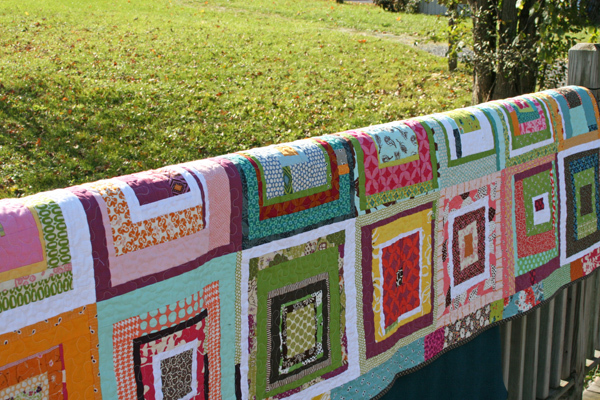 This is such a gorgeous quilt Ashley! It looks great on your bed! Stunning as usual Ashley. That must have been hard to quilt! Your quilt is really gorgeous! Thanks for sharing the photos. So glad to finally see this one done! It’s gorgeous! i just finished my first bee quilt top. it is so fun! I think I’ve been waiting to see this one for 2 years. 😀 My favorite quilt out there I think. LOVE it. Gorgeous! It’s the star of your bedroom! Awesome quilt! Love those fabrics! It’s a VERY ‘happy’ quilt! 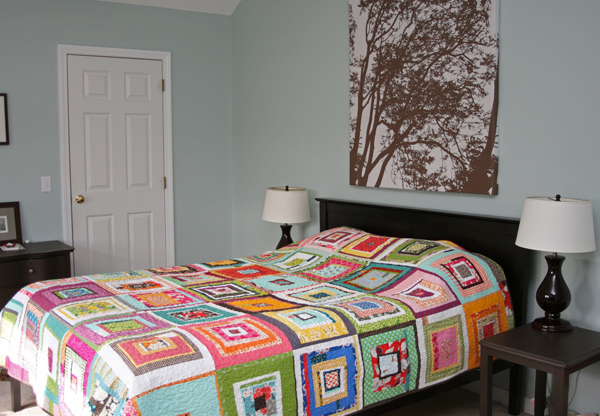 The quilt looks wonderful in your bedroom! It is really a centerpiece of the room. 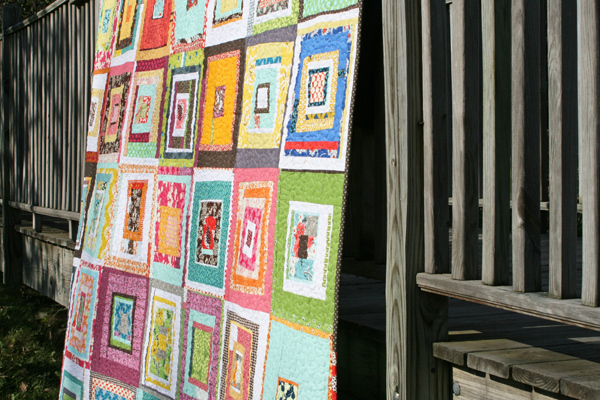 I love reading your posts and seeing photos of your latest- I get so inspired.This post reminds me that I have a whole caboodle of blocks that are “just sitting” in a box that I could make into quilts or wall hangings for presents – what am I holding on to them for? If I wait much longer they may just get tossed in the landfills unnoticed. Also I need to say that since it seems there are no clothes designers that I can buy “off the shelf” that appeal to me and are affordable I am heading back to the make it myself era – sometimes I wonder why I ever left it! Thanks again! A queen sized log cabin quilt? That is amazing! Even if you had a w blocks done by others, that is still a huge accomplishment (and the quilting alone is an accomplishment!). It is stunning! Way to go! Congratulations! Those were the prefect little details to finish it off. This is such a happy quilt. I’m sure you’ll smile every time you see it for a while. Congrats on a great finish! It’s a beautiful, very colorful quilt and it looks great in your room. Oh Ashley, this is beautiful!! It looks gorgeous on your bed!! Oh I love it! It does seem more special knowing the contributions from everyone. great job getting it done, ashley! so fun to see all those blocks again!! What a vibrant, happy quilt! Thank you for sharing all your wonderful projects with us. I love this quilt. Your quilts and seeing of clothing give me inspiration. Off to a week-end of quilting. ooops. That is sewing of clothing. Wow – I don’t comment often, but I have to on this one. That is one truly stunning quilt! Yay for your bed!! Love your quilt. I am sure it is more special because of all the work put into it by your fellow quilters. Pingback: WIP–Wonky Log Cabin Christmas Blocks « OccasionalPiece–Quilt! This is just breathtaking – pure happiness. 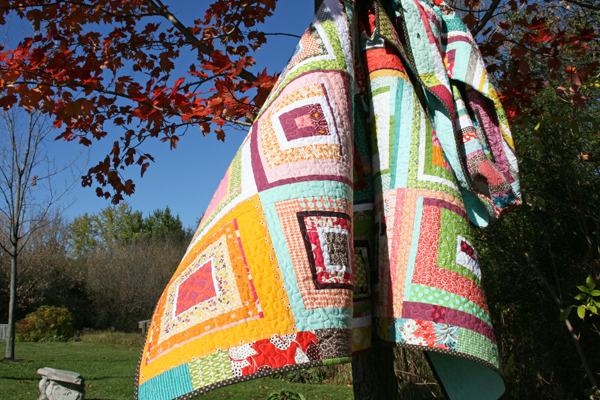 wow, ive always thought the whole hanging a quilt up on a wall thing was pretty tacky but these quilts are so beautiful cute and unique i would even do it with those!lol i wish i could sew so bad!!! this makes me want to even more!!! I love this fantastic quilt! All your projects are wonderful!